You are here: Home / Weekly Columns / Opinion / iPad Air 2 vs Amazon Fire HD 8 Tablet: A Data-driven Comparison. iPad Air 2 vs Amazon Fire HD 8 Tablet: A Data-driven Comparison. 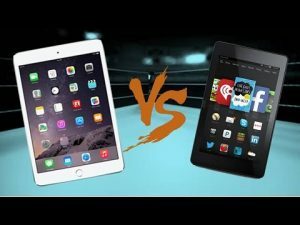 (ThyBlackMan.com) If you keep the budget aside, the iPad Air 2 vs Amazon Fire HD 8 tablet is an interesting battle. If you are an average user who simply consumes content, this is the right time to consider choosing one. For iPad Air users, there’s actually nothing that would persuade them to replace their device with a new iPad Air 2, but if you want a tablet, read on to see what comes out when we compare the offerings from Amazon and Apple. The Apple iPad Air 2 comes in beautiful design which is lighter and thinner than the previous model. The device features double RAM, a tri-core CPU, and good battery life. Its camera makes it an excellent photography tablet. Additionally, you get fingerprint sensor, high-quality sound, and select applications. There’s so much good about the Apple iPad Air 2 but there are subjective drawbacks too. Since it comes from the Apple family, the application ecosystem is less open to changes. The camera quality, especially video capture is not as per the iPhone 6 standards. If you own its predecessor, comparing the sound will also make you realize that the sound has been reduced in the new model. On the other hand, we have Amazon’s US$79.99 tablet Fire HD 8. Low price, Wi-Fi connectivity, and improved audio altogether make it easier for anyone to ditch the Fire 7 and get the new Fire HD 8 tablet. While you can’t expect the tablet to beat iPad Air 2 at this price range, the Fire HD 8 is a good fit for light gaming and media consumption. It is one of the best affordable tablets. The comparison of their screen size is subject to users’ choice. Amazon gave an 8-inch screen to the Fire HD 8, while the iPad Air 2 follows the trend and comes with a 9.7-inch screen. Both the devices feature IPS display while the iPad Air 2 brings a scratch-resistant glass with oleophobic coating. Since the screen sizes are different, Fire HD 8 gives you 800 x 1280 pixels resolution with 189 ppi pixel density. The iPad Air 2 with its bigger screen has 1536 x 2048 resolution with 264 ppi pixel density. If you compare the iPad Air 2 with the previous model, the new device appears to be thinner (6.1 mm thick) than the original iPad Air. The noticeable difference is around 1.4 mm. iPad products are known for their premium build quality. The material looks classy and feels rich and comfortable in hand. If you compare the build quality with the Fire HD 8, there’s absolutely no match. Amazon’s device comes in a plastic shell and is available in black, red, blue and yellow colors. The dimension is 8.43 x 5.04 x 0.30 inches making it a small lightweight tablet weighing around 311 g. If you want a decent e-book reader, Fire HD 8 is an ideal device, but it feels heavy to hold in one hand when you’re reading. The device is not water resistant and is not meant for rough use. Apple iPad Air 2 is water resistant and doesn’t feel too heavy considering its size. An above average user will get frustrated with the Fire HD 8, but iPad Air 2 won’t disappoint even the serious gamers. The plastic shell gives Fire HD 8 an edge because it can easily survive a few drops while you can’t guarantee the same in iPad Air 2’s case. iPad Air 2 brings 1.5GHz CPU and a 2GB RAM and appears to be a beast against the Fire HD 8’s 1GB RAM. As far as their quality of the cameras is concerned, Apple wins the game. Since there is a huge price gap between the two, iPad Air features more storage space than the Fire HD 8 tablet. The iPad Air 2 gives more safety with a fingerprint sensor, allows you to synchronize the device data with other devices, supports integrated graphics for gaming and other apps. The device also supports sharing intents to make content sharing easier for users. Amazon Fire HD 8 is a good budget tablet and it will remain a budget tablet. It focuses on solving the basic needs and can be handed to the kids as it comes with child lock protection. The two devices solve various similar and different purposes. Since they belong to the same tablet segment, Amazon Fire HD 8 is better in terms of how you use it. If you are an average user, there’s no point in shelling out hundreds of dollars on iPad Air 2. If you are not bound by the budget, it is better you get an iPad Air 2 because Fire HD 8, after some time, will make you want a new tab since its configuration is quite poor and can’t give you a complete tablet experience. Why compare a 79$ tablet to a tablet that retails, discounted, over 300$? That’s like comparing a Nissan Versa to a Nissan GT-R.
Classic apples vs oranges dilemma here. Um, why is an article showing up about a device that is almost 3 years old? The new IPad came out months ago that replaced the Air 2, which isn’t even available any more. ipad Air 2 all the way. After all these years “Apple” still is 1# when it comes to tablets. Amazon Fire tablets are for kids.